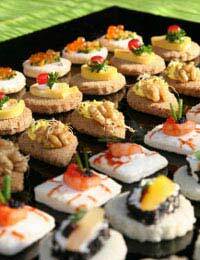 Delicious canapés are a lovely part of Christmas. Tasty treats can seem like too much faff the rest of the year but make perfect sense at Christmas. They’re lovely with a glass of mulled wine or a flute of champagne if you’re pushing the boat out. There are lots of good ideas that you can pinch from the supermarkets to copy, or even buy from the supermarkets instead, but there is something wonderful about offering your guests a plate of home made treats instead. Slices of cucumber are the perfect vessel for a number of canapé toppings, with fishy toppings going particularly well. It’s easy to put a couple of cucumbers in your Christmas trolley and you can even leave the application of toppings up to your children once you’ve cut the slices. Don’t cut the slices too thick or too thin – about ½ centimetre maximum – you can make fancy shapes by semi-peeling the cucumber if you like. Spread with a bit of cream cheese, using a piping bag if you want to make them look really fancy, mixing in chopped herbs or chilli for a twist. Then top with a little blob of caviar (lumpfish roe is perfectly acceptable), a piece of smoked salmon with a sprig of dill, a mix of smoked mackerel and horseradish or juicy prawn. It’s a good idea to make a big batch of tartlet cases and keep them in an airtight container. Use ready made pasty to save time but don’t cut the edges too neat and they’ll keep that desirable home made look. They’ll keep for up to a week and will benefit from a few minutes in a hot oven to crisp them up. Delicious veggie fillings include a spicy tomato salsa, curried mushrooms, goats’ cheese and a piece of fig (as long as your guests eat cheese) or butternut squash roasted with spices like chilli, cinnamon and fennel seeds. For meat eaters, try filling your tartlet cases with chopped cooked chicken in sauces such as coronation, piri piri, tandoori or green Thai curry. You can also put a little natural yoghurt topped with a twisted slice of roast beef and a tiny blob of wasabi paste. If your cupboards are bare, even cheddar and pickle looks posher in a tartlet case! Bruschetta always impress your guests and they are ideal as a relatively substantial canapé if you’re not having a starter. Simply cut a baguette into thin, diagonal slices – you may want to do two or three baguettes depending on how many you want to make. One baguette makes around 15 slices. Put a good glug of olive oil with plenty of seasoning into a shallow bowl and either using your fingers or a pastry brush, spread a light coating of the seasoned oil onto both sides of each slice of bread. If you like garlic, just rub a clove directly over the bread before applying the oil. Now you can grill or oven-bake the slices until crispy and golden brown – watch them carefully as they can catch really quickly. Top your bruschetta with whatever tasty morsels you can think of – use some of the ideas above, or go for something completely different. Try a thick pea and mint puree (simply blitz cooled cooked frozen peas with a few mint leaves and some cream cheese), or a sun-dried tomato paste with a piece of mozzarella and a leaf of basil or, for the veggies, how about a rich ratatouille? You can also make your bruschetta and tarlet cases in advance - they will keep crunchy in a sealed container for at least a week - ideal for a quick nibble when unexpected guests turn up.